Bit of a news flash - I moved to Germany. And as a result, I haven't sewn a stitch for six weeks. SIX WEEKS!! And I'm really recognizing how true the saying, "Quilting is my therapy" is cuz without it, the stress of this move is just about to do me in! But I did save a few finishes for this down time (....and I didn't have time to blog in the pre-move busyness) so I could get a quilting fix through blogging about it. Maria's favorite color is purple, something I don't have a lot of in my stash. But Northcott fabric had sent me a few yards of their Artisan Spirit Ambience Violet to test and I still had a quite a bit of it left. Perfect! 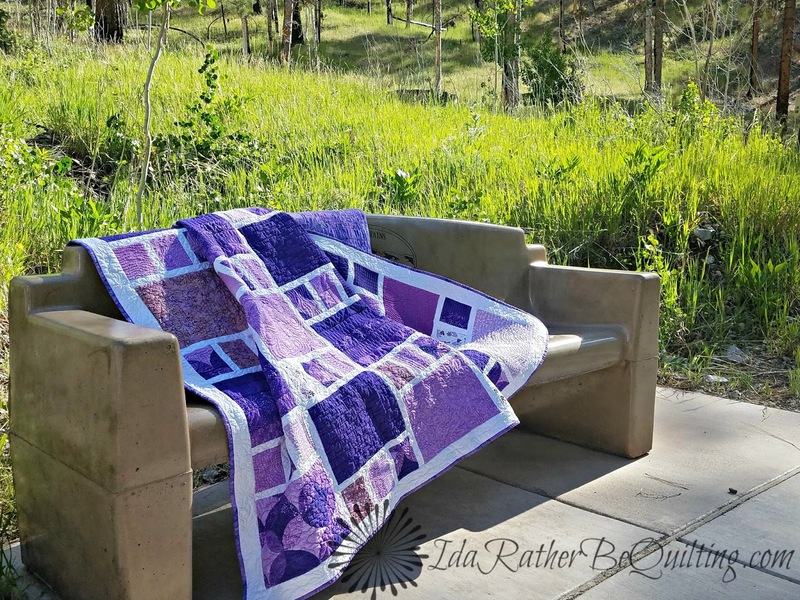 The pattern is Craftsman by Amy Smart. Now I think Craftsman tools from Sears when I read that but she meant windows in craftsman style houses. Either way, its a really great pattern to show off larger scale prints that you don't want to cut up too tiny and it works up fast. I added a couple of prints from Typography from Cloud9 Fabric, a lovely Gelato ombre, and a random batik that I've had in my stash forever. They all played nicely together and both Maria and I were very pleased with how it turned out. 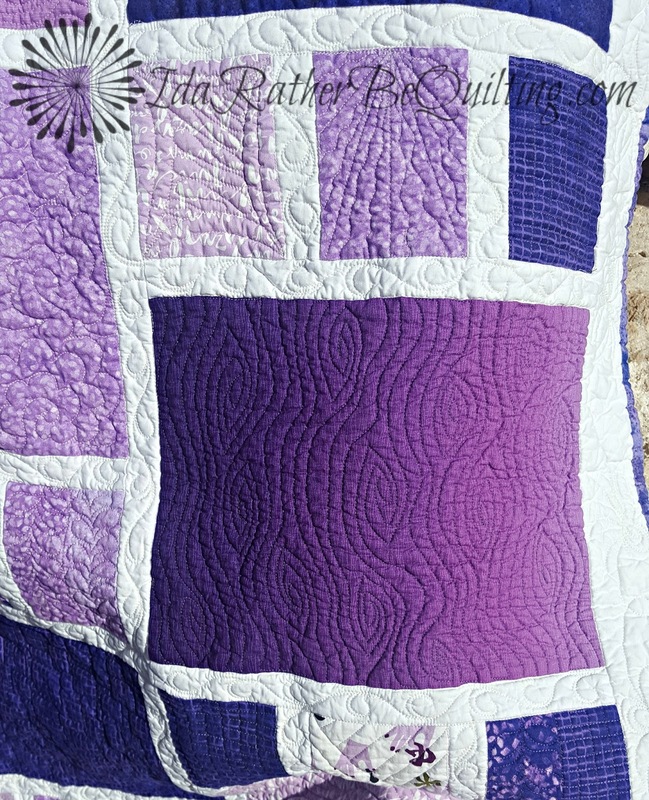 I had lots of fun with Olga finding different patterns to quilt in each large block. After washing, we had all kinds of yummy texture. 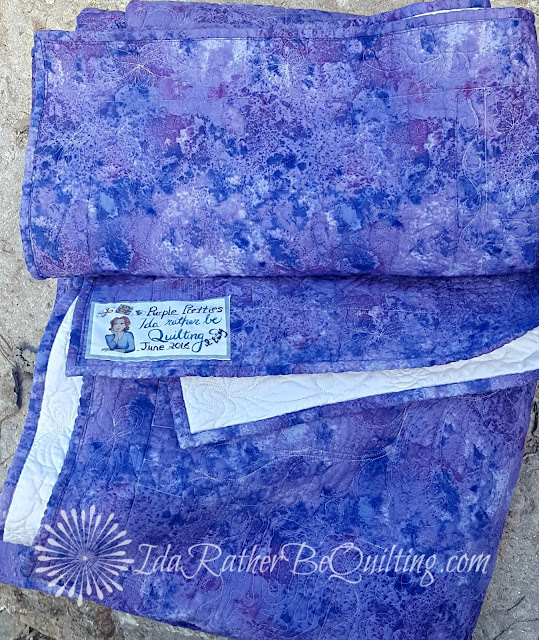 I had purchased some wide quilt backing fabric for the back in a nice lavender. Did the binding by machine but hand stitched on my label. Did you notice these aren't my normal brown desert photos? 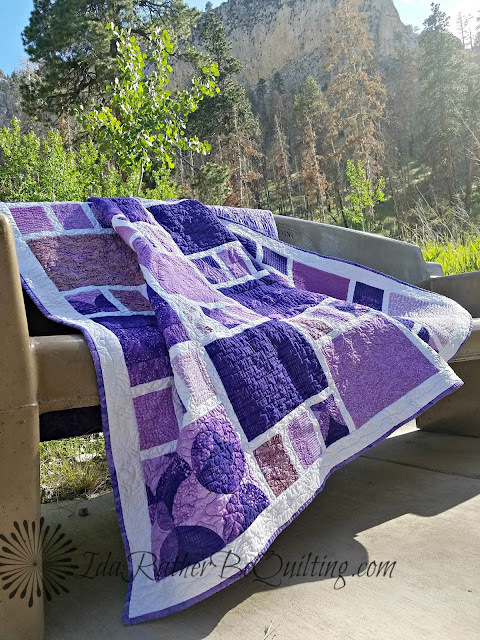 We took the quilt with us on a picnic up to Mount Charleston where it was green and beautiful. Well, green compared to the desert around Vegas anyway. Purple Pretties was my next-to-last quilt made in Las Vegas. 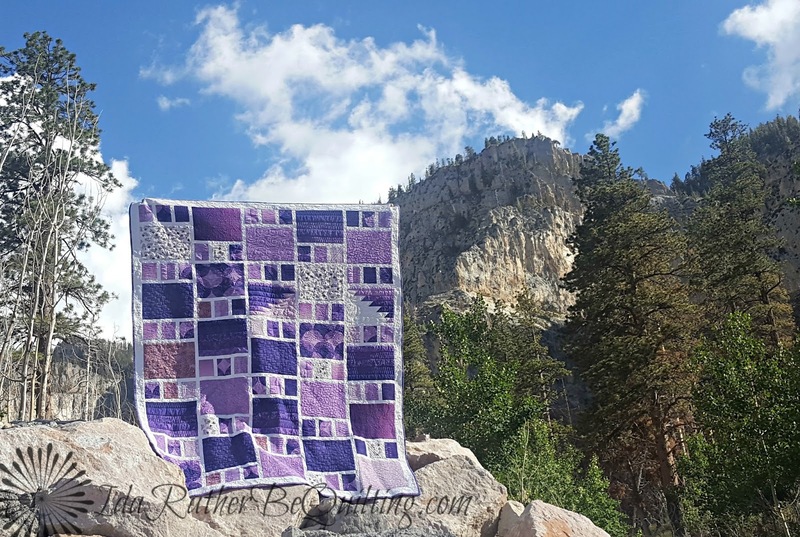 The final quilt was a gift for a dear friend's daughter who is getting married in 2 days!! I shipped it off to her without taking many pics but they have promised to send me some. So stay tuned for a blog post about that quilt. And send some prayers my way that Olga and Helga make it across the ocean with no damage.